This is the 105th edition of the Epileptic Gibbon podcast music show and the playlist to accompany it. CLICK HERE TO LISTEN. You can also listen via Mixcloud here. This edition of the show represents the second of my rather delayed ‘Best of 2012’ shows. There’s no feature album this time around, just lots of great music from the UK, the US, Sweden & beyond. Below you’ll find the track list, plus weblinks to where you can find more information about each artist. Total running time: 1 hours & 52 minutes. Downloaded file is 102.3 MB. Many thanks to everyone involved with this show, musicians and listeners alike. Please leave a comment if you like what you hear (or even if you don’t… feedback is so important!) or if you want to have your say on anything else connected to this podcast. If you want to keep up to date with news about the show, EppyFest, or just chat with other listeners, don’t forget that there’s a Facebook group – just search for the Eppy Gibbon Podcast Show on Facebook and request to join. 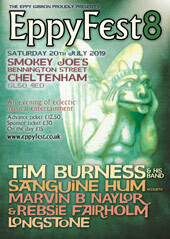 The next show will be part three (of four) of my review of 2012, so I hope you’ll come back for that and maybe I’ll see you at EppyFest on Saturday July 6th – please come and say hello.